Nothing dates your kitchen like old appliances. If your white stove is bringing your style down, but a brand new stove isn't in your budget, don't despair. 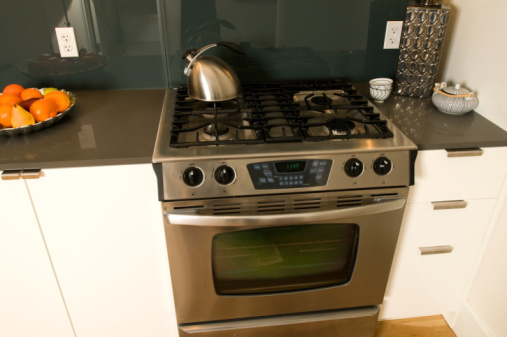 You can paint your stove to look like stainless steel, giving your kitchen a sleek, more modern look. Changing the color of your stove is a do-it-yourself project that can be completed in less than a day. Stainless steel is a popular appliance finish, but it tends to be more expensive than white. Move the stove to a suitable location for painting. You need a well-ventilated area, especially if you use a spray product. If you are indoors, cover the room with painting drop sheets to protect it. Clean the stove thoroughly with a degreasing product. Removing grease and other buildup ensures the paint will adhere to the surface. Mask off any areas you don't want to paint with masking paper and tape and pull off removable knobs. Sand the area to be painted with 400-grit sandpaper, followed by 600-grit paper to degloss the existing paint. Gently abrading the surface will allow the paint to adhere. Vacuum and wipe the stove surface with denatured alcohol to remove any residue from the sanding. Put on your ventilator mask. Spray the area to be painted with two or three coats of self-priming appliance epoxy, following product instructions for dry time between coats. Overlap by about a third on each pass with the spray paint. Brush-on appliance paint is also available, but may not be as easy to apply evenly as a spray product. Allow the paint to dry for several hours or the time specified by the product instructions. Remove the masking tape and paper and replace any knobs that were removed.